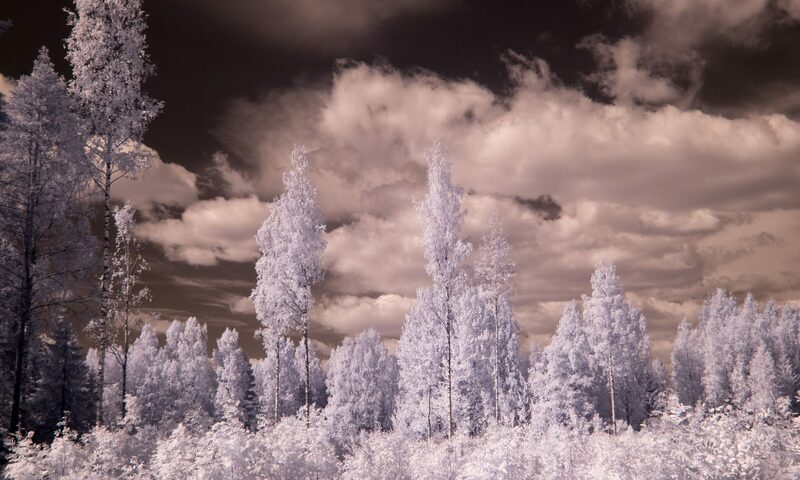 Ultimate vs. proximate questions: Can plants use UVB to predict the future? 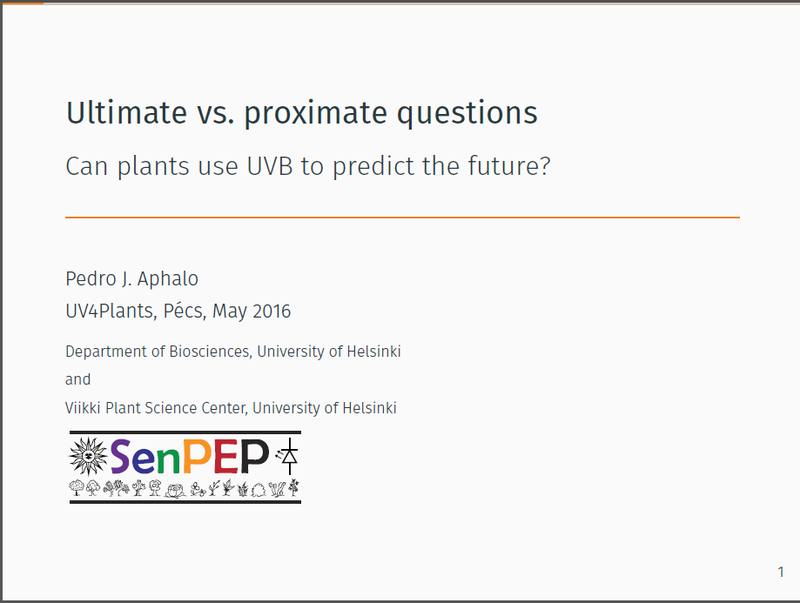 Slides from my presentation at the 1st UV4Plants Conference in Pécs, Hungary, on 31 May 2016. We have been using R for our data analyses for several years, and accumulated expertise and scripts for calculations related to photobiology. After more than two years of work of programming and documentation writing, in the last year I have submitted eight packages to the CRAN repository, packages that are now widely available for anybody to use. All code and documentation is open-source and open-access. There are still more packages under development of which the ones I find more interesting are two that allow direct acquisition of spectral data from within R allowing use of all the power of R to analyse spectra in almost real time during measurements. They also incorporate state of the art correction algorithms for array detector spectrometers. 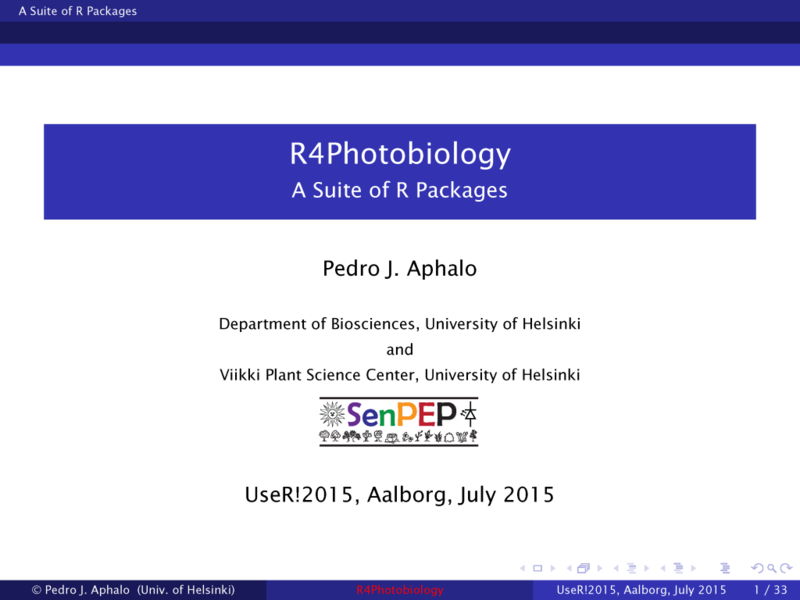 The suite of packages has its own web site at http://www.r4photobiology.info and those already in CRAN can be searched through METACRAN. In recent times I have been participating in RCAFi (Red de Científicos Argentinos en Finlandia = Network of Argentinian Scientists in Finland) of which I am currently the scientific coordinator. 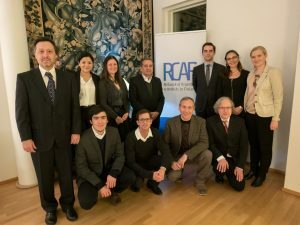 The minister of Science and Technology of Argentina recently visited Finland, and RCAFi members had dinner with him at the Ambassador’s residence. We have published two books through Leanpub. They are not yet 100% complete but they are available for download. 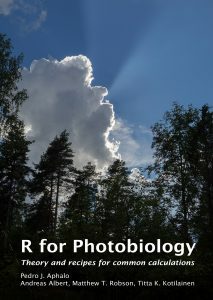 Cover of the book “R for Photobiology”. 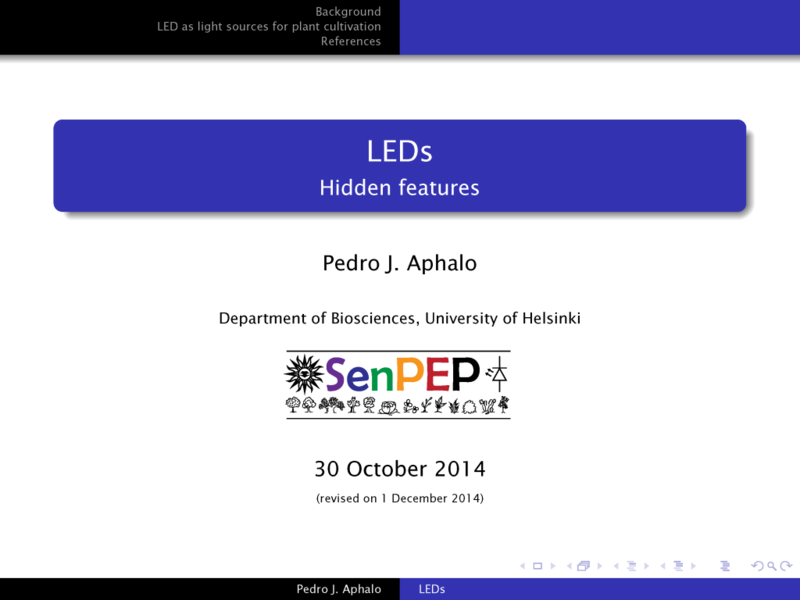 This handbook describes how to use R as a tool for doing calculations related to research in photobiology. Photobiology is the branch of science that studies the interactions of living organisms with visible and ultraviolet radiation. The most frequently used calculations are related to the characterization of radiation and of the responses of organisms to radiation. Many of these calculations are also used in Biophysics, Meteorology and Geophysics. 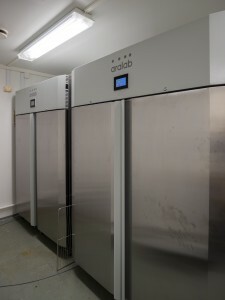 aralab growth chamber with Valoya B50 luminaires. Two new growth chambers have been delivered some days ago and were switched-on yesterday. We have been longing for good chambers for some time, in particular chambers with a rather small size but capable of achieving high irradiance. Our chambers were supplied by Aralab with a series customizations that will make them very well suited for our research in photobiology: LED lighting using a modular design, at the moment with Valoya B50 fixtures “AP67”, but user exchangeable by other types lighting modules. Dimming is possible down to 10% on each of three “channels” allowing a range of irradiance at 20 cm from the enclosed lamp canopy ranging from 40 μmol m-2 s-1 to 1100 μmol m-2 s-1, being possible to set steady-state irradiance in steps as small as approximately 5 μmol m-2 s-1, and to program stepless irradiance ramps. Being the design modular, although currently all our B50 modules have the same spectral emission characteristics, will allow us to mix and match B50 modules as needed and control the mixing ratio between three types of spectra if desired. The main idea of this design is to be able to achieve at reasonable cost a system that will allows us to grow plants under different light spectra without sacrificing the ability to achieve a high irradiance under each of them. Another important design point for our research is that the “window” of the lamp canopies can be easily exchanged, and given the rather low downward thermal radiation emission of the LED fixtures, plastic sheeting can be used. This will allow when needed in the future to use coloured filters, or UV-radiation transmitting acrylic. 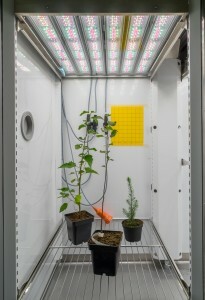 The use of LEDs together with temperature-dependent ventilation of the lamp canopies should result in irradiance in the plant growing area to remain, at a given lamp control setting almost independent of the temperature conditions used in the experiment without need for a feedback control system. This is a fundamental difference with fluorescent tubes located in the plant growth space, for which the light output is extremely temperature and air movement dependent, output decreasing with decreasing temperature. The chambers are specified to reach a few degrees below freezing in darkness and +5 C with lights on. Humidity control is possible as well as CO2 concentration control, within the range 200 to 1500 μmol mol-1. 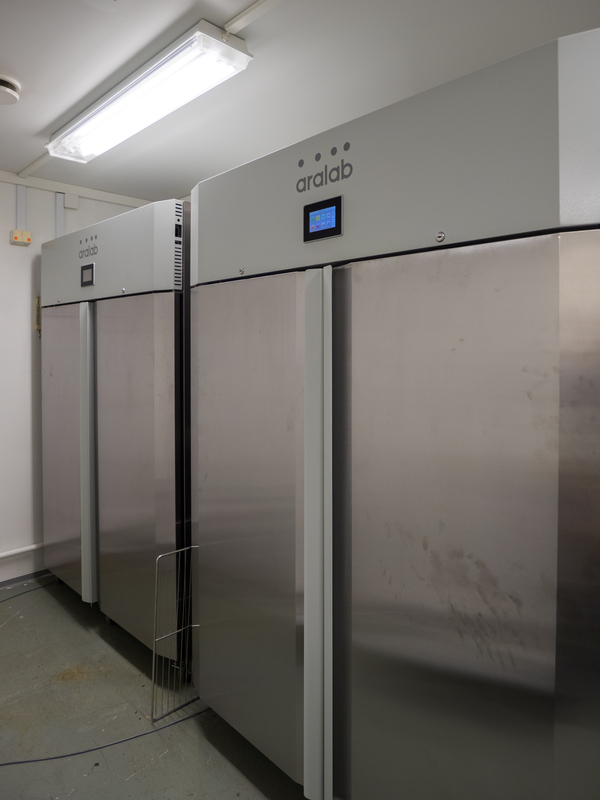 Our chambers are customized Aralab FITOCLIMA D1200 PLLH. The in built controller and the remote access software seems well thought out based on our experience of the last two days of on-site training. More information is available at Aralab’s web site. I will post in coming weeks some test results and further impressions on these new chambers. Meanwhile I would like to thank the Aralab people for their willingness to listen to our wishes and work along with us in finding the best possible customization for our research needs. I should mention that I have been myself repairing and modifying growth chambers in the past, even designing and assembling simple electronic control systems for chambers already while working on my M.Sc. thesis, long ago and far away. This afternoon I gave a talk at this important R conference, please, click below to access the PDF file of the slides I used. First public presentation on the R packages I have been working on. A special issue of the journal Plant Cell & Environment on UV Radiation has been published on-line. I acted as the lead guest editor for the issue. It is available through the PCE website. conference ‘Phytotron Research — Analysis of Plants in Controlled Environments’, held at the Helmholtz Centre Munich, Neuherberg, Germany. Released under a CC BY-SA 4.0 licence). 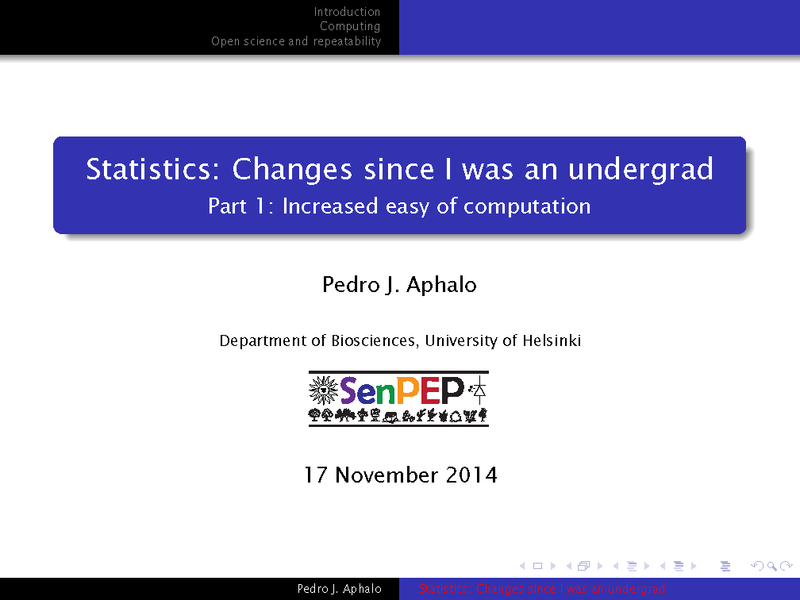 I have recently given a series of four seminars on how the increased easy of computation has drastically changed how we should approach data analysis and statistics. 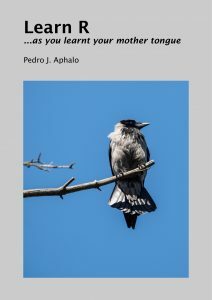 I have edited the files replacing some of the photographs with images that allow me to release the four files under the CC BY-SA 4.0 licence. Lecture no. 1, Lecture no. 2, Lecture no. 3, Lecture no. 4. The International Association for Plant UV-Research has been born! It is an offspring of the COST Action FA0906 UV4Growth. I am the ‘communications officer’ of the new association, and I have built the web site that has been since yesterday ‘open to the public’.